Commodity Trading System is a comprehensive solution from Mantissa Infotech for online trading of both agriculture & non-agriculture commodities. It is designed to function both for Spot & Forward (Not Futures) Trading of commodities. This is a hybrid system which encompasses two ways of trading – Traditional Auction & Order Driven (like it is in NSE/BSE). It supports both Forward (for Selling) & Reverse auction (for Buying). Dealing with the inherent needs of commodity market, it has built-in Risk Management & Delivery Settlement modules. User definable quality parameters functionality & seamless to & fro Unit of Measurement conversion at various stages feature (and many more features) make it a feasible trading solution for any and every commodity. This system is developed for Commodity Forward (Not Futures) Contract Trading. However, this system has nothing to do with Commodity Futures Trading. Squaring off in TSD contracts allowed up to the day of delivery. The first seller would not be able to transfer his delivery obligation to any other seller by squaring off his sell position. However, the first seller would be able to square off his position against the last buyer/s of his product, on the board, who opts to sell. Cancellation of deal between the buyer and the seller is possible if they mutually agree but only with the consent of the Exchange. The Square off facility shall not be available. Every trade shall result into delivery. This Trading system allows the users to enter both Buy & Sell Orders, and matching is done on Price & Time priority basis. The orders are first matched based on Price, and if there are two orders at the same price, the first order would get priority in matching over the second order. An order may match partially with another order resulting in multiple trades. A system where potential bidders place competitive bids on commodities and assets and at the end, best bid wins the auction. This is a conventional system of Trading at APMC with which all Physical Market participants are familiar. This system would provide an electronic platform for efficient and transparent trading in all Commodities having any quality specification using Auction Trading System offering the English Auction (Fixed Quantity), Open Bid Reverse Auction (Fixed Quantity) as well as Fixed Price Auction, which is similar to Order Driven System. The technology plays a very vital role in the functioning of the Exchange. We have studied the various Trading systems / platforms used by National Exchanges for Futures Trading and the current system of Physical auction prevalent at APMCs. Based on this, our Exchange has developed a unique model of Trading by replicating the conventional Physical Auction trading system at APMCs into the Electronic System. The Auction trading system offers greater flexibility and ease for trading in Customized contracts unlike Commodity traded on Futures Exchange which requires unique contract code for each customized contract traded on the Exchange. Thus, the proposed Electronic Auction system would have all the benefits of an Electronic Trading system while having the ease and flexibility of conventional Auction system. This system is similar to the Physical Auction System (English Auction) followed by APMCs, and therefore it is easier to explain and implement for physical market participants. The training would be required to be provided to the physical market participants for using and implementing the system. It is having the Graphical User interface and the sellers can put the images of each Commodity along with detailed specifications. It would be having the simple interface similar to any broker trading terminal. The market / bidders are deciding the fair price of the underlying. Buyer/Seller has to decide the price prior to putting the order in the system. Forward auction is a selling proposition where bidders are the buyers. Buyers place their bids, trying to outbid the current highest bid. Buyer with highest Bid (H1), at the end of the Auction, is awarded the auction. Reverse auction is a buying proposition where bidders are sellers. Sellers place their bids, trying to outbid the current lowest bid. Seller with Lowest Bid (L1), at the end of the Auction, is awarded the auction. The Sellers can sell their commodity either by Creating a Forward Auction (Fixed Quantity or Fixed Price) and inviting the Bids from the interested Buyers. The highest bidder (Buyer) would be the Auction winner to whom the Seller would be obliged to sell his commodity. The Sellers can sell their commodity by Bidding in the Reverse Auction (Fixed Quantity or Fixed Price) created by the Buyer. The lowest bidder (Seller) would be the Auction winner from whom the Buyer would be obliged to buy. The Buyers can buy the commodity either by Creating a Reverse Auction (Fixed Quantity or Fixed Price) and inviting the Bids from the interested Sellers. The lowest bidder (Seller) would be the Auction winner from whom the Buyer would be obliged to purchase his commodity. The Buyers can buy the commodity by Bidding in the Forward Auction (Fixed Quantity or Fixed Price) created by the Seller. The highest bidder (Buyer) would be the Auction winner to whom the Seller would be obliged to sell. It is the most common type of Ascending Auction where successive bids by buyers are higher than the previous bid. Buyers place their bids, trying to outbid the current highest bid. Buyer with highest Bid (H1), at the end of the Auction, is awarded the auction. This is similar to order driven system. The auctioneer (Seller) decides the price before auction starts. Buyers just bid the quantity. Entering the bid yields to trade. It is the most common type of Descending Auction where successive bids by Sellers are lower than the previous bid. Sellers place their bids, trying to outbid the current lowest bid. Seller with lowest bid (L1), at the end of the Auction, is awarded the auction. This is similar to order driven system. The auctioneer (Buyer) decides the price before auction starts. Sellers just bid the quantity. Entering the bid yields to trade. 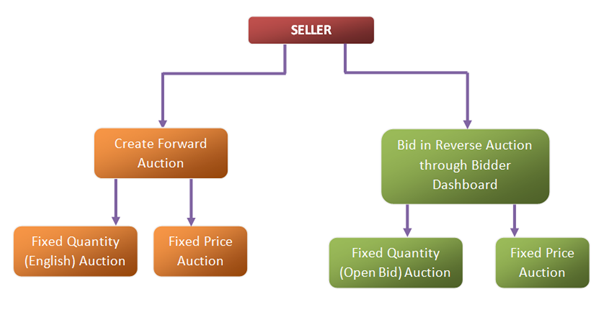 While creating an Auction, the Auctioneer can decide whether the auction is TSD or NTSD, Delivery Centre whether Designated Warehouse or Other, Start Price, Price Quotation Factor, Tick Size / Minimum Bid increment in case of Fixed Quantity Auction, Minimum Bid Quantity in case of Fixed Price Auction, total Auction Duration, Auction Timeout, and whether Sniping Prevention required or not. The Auctioneer can modify the Start Price of the Auction before any bids are received. However, once the bid has been received, the Auctioneer cannot change the Start Price. The Bidders can bid either by entering the Bid Price or using the Quick Bid option. If Quick Bid is pressed by the Bidder, the bid is auto incremented by one Tick in case of Forward - English Auction and auto decremented by one Tick in case of Reverse - Open Bid Auction. The margin of the Auctioneer would be blocked at the time of Auction Creation. In case the Auction is not successful and gets closed without receiving any bids, then the blocked Margin of the Auctioneer would automatically get released. Else, it would be blocked either till Squaring off of the position or till fulfillment of Delivery obligation by him. The margin of the Bidder would be blocked immediately upon bidding. However as soon as a better bid is received in case of Fixed Qty Auction (English / Open Bid Auction), the margin of the bidder who has been outbid would get released. The margin of the successful bidder would get released on fulfillment of Delivery obligation by him. In case of Fixed Price Auction, the Margin of the bidder would get blocked in proportion to the Bid Quantity, whereas the Margin of the Auctioneer would be blocked for the complete quantity that has been put for Auction. The Auctioneer may choose to define a time period after which the Auction would be closed automatically if no bids are received. The Auctioneer may choose to go for Sniping Prevention to safeguard against any malpractice. Or Extend the Auction time by n minutes if bid is received during last m minutes, where n and m can be specified by the Auctioneer. The Auctioneer can also specify this process to be repeated for 2-3 times before closing the Auction. The buyers of an Auction can square off their Trades by creating a Forward Auction which would have the same specifications as the original Auction created by the First Seller. While squaring off, he cannot change the Quality Specifications, Delivery Centre, and Delivery Date. He can only mention new Auction Qty and Base Price / Fixed Price. The First seller, in case of both Forward Auction and Reverse Auction will not be able to square off their Trades. The Exchange would allocate Trading limit to the Members for Trading on this platform. The Members can allocate the limits to their Branches and Clients. This trading limit will be dynamically blocked/released based on creation of the auction, placing of a bid, completion of the auction, fulfillment of delivery obligation, cancellation of the auction etc.